I'm glad you added that hankies are for blotting your face on hot days. In Japan, that's what hankies are used for and something else: drying your hands at public restrooms. The cool thing is, instead of wasting paper towels or electricity for those blowdrier things, a hankie will do it without taxing the environment at all. I can't wait to see your printed toys! It's something I've been planning to do myself. The hankies are lovely. Is that spherey I spy on there? I can not wait to see your printed toys! I've enjoyed your knitted ones so much that I am eager to see what you get up to next! So hello! from a fellow lil'fellows-maker from Sweden. Hello! Thank you for the mention, I've been loving your work for a long time, so I'm pleased as punch ! 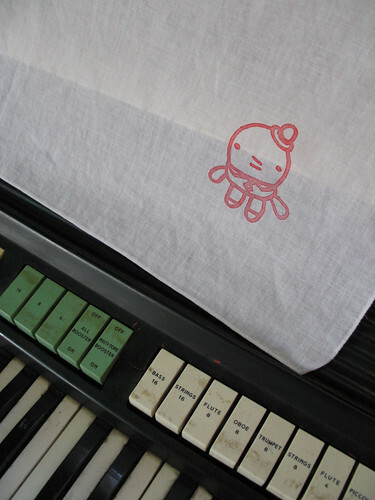 enjoying your blog and i might think about carrying my snot around with me if i had this cute hankie! this is great and you are quite funny!